That is about the dumbest article I have ever come across.I hope that its just satire. The reason Kentucky Fried Chicken changed to KFC has nothing remotely to do what was posted and is patently stupid to think so. They changed to KFC for the simple fact that the state of Kentucky had a large defecit, to drum up income, they copyrighted its name ( look it up )and KFC did not want to pay the Kentucky state government a windfall in royalties. It is also the same reason why The Kentucky Derby changed to Churchill Downs.Its all very well documented. I agree with the other anonymous person just the dumbest article ever. Another known fact of animal cruelty. clearly the chickens in the pictures have both feet and beaks, plus there are no tubes shoved down there throats and why the hell would you feed an animal blood for nutrients.......steroids would do the job a lot quicker but either way we all agree this article is as bogus as angelinas lips. AS the other commenters have said this is a load of crap. 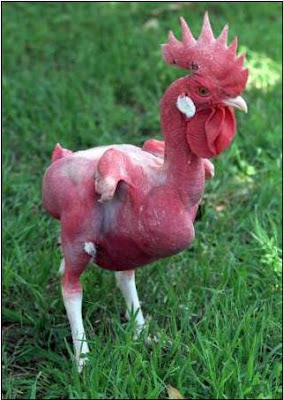 KFC uses chickens. 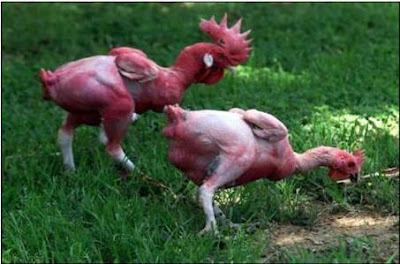 (they aren't test-tube chickens or whatever). That said KFC does have one of the highest, if not THE highest, fat content out of all the fast food chains.